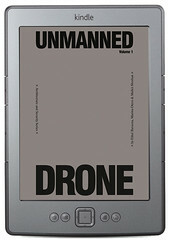 DRONE is the first issue to be published from the Unmanned, Architecture and Security Series research project and publication series. Drones are unmanned vehicles [UAV]. They are either remotely controlled or, increasingly, autonomously following a pre-programmed mission. Initially, they were developed for use in conflict situations, but the technology also lends itself to a variety of civic purposes, from urban surveillance to monitoring agricultural fields and poaching. UAVs can transport objects, from bombs to books and pizza boxes. In conflict situations they can be used for targeting and killing individuals, but also for providing medical assistance. Drones are cheap to produce and have become faster and smaller in recent years. They can fly solo missions or operate in formation. This issue presents an overview of the drone technology and the expansion of its operational area, which is strongly connected to the technological evolution triggered by the use of virtual technology and the use of data. Increasingly, decisions are not based on conclusive evidence, but on speculative scenarios. Contributors: Dan Gettinger, Catherine Harwood, Arthur Holland Mitchel, Yael Messer, Ruben Pater, Francesca Recchia, Gilad Reich, Matthew Stadler, Jane Szita. This book has been possible with the support of the Graham Foundation for Advanced Studies in the Fine Arts, the Het Nieuwe Instituut, and the Creative Industries Fund NL.